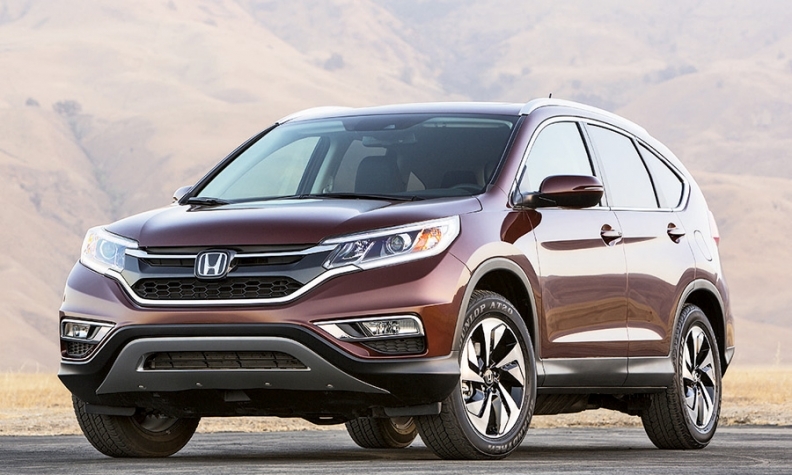 The upscale Touring trim line is new to the Honda CR-V for 2015. Starting at $32,350, it includes driver-assistance technologies. LOS ANGELES — The spruced-up 2015 Honda CR-V went on sale last week with a more premium feel in a move to keep its mantle as the country’s best-selling crossover. The fourth-generation CR-V debuted in 2012. Honda has made more than 60 improvements to the vehicle for its midcycle update. “The CR-V has grown into a major sales pillar in our lineup,” said Jeff Conrad, Honda Division general manager. He called the update for the 2015 model year ambitious, with major improvements across board. The 2015 CR-V has a more expressive grille, a lower, sportier stance and upgraded interior materials and finishes intended to appeal to higher-end buyers, Conrad said. Beneath the hood, the CR-V has a new 2.4-liter four-cylinder direct-injection engine and continuously variable transmission. The crossover puts out 185 hp and its torque has improved 11 percent to 181 pounds-feet. Overall fuel economy has improved 4 percent, with the front-wheel-drive mode achieving 27 mpg in the city, 34 on the highway and 29 combined. The four-wheel-drive mode gets 26 mpg in the city, 33 on the highway, and 28 combined. It comes in five trim lines: the base LX (starting at $24,150), the EX (starting at $26,250), EX-L (starting at $28,850) and EX-L Navi (starting at $29,880). New for the 2015 model year is the upscale Touring trim line, starting at $32,350. All prices include shipping. The Touring trim line comes with a driver-assistance technology package that includes lane departure warning, adaptive cruise control and forward collision warning. It also has LaneWatch — a feature that displays a wide-angle view of the passenger side lane when the right turn signal is activated, as well as Honda’s lane-keeping assist and collision mitigation braking systems. The CR-V was the seventh-most popular vehicle overall in the U.S. through September, with year-to-date sales up 5 percent to 241,015 units.